I am so ashamed. I haven't had time to add to my blog since last November. So much has happened since then that I need to go back to November and start at the beginning. In December, Eddie and I went to England to spend Christmas and New Year with his Mum and his extended family. 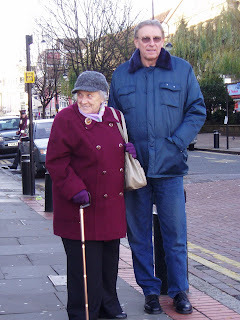 Here is my favourite photo of the two of them together, standing in Anlaby Road in Hull, Yorkshire. My lovely mother-in-law certainly doesn't look 84 years old in this trendy outfit!